In personality they are creative, curious, connected, feisty, narcissist, over achievers and skeptic of today’s leaders. They question authority and usually prefer to work in teams with people they can relate to. In fact, the average number of years they endure in a specific role or organization is two. After two years, they will usually look for better opportunities or new challenges in the current workplace. A well guided and motivated Y is very productive to have in the workplace because they are quick learners and enjoy team work. Most importantly, this generation likes to work WITH companies and not FOR companies so they need to feel like they belong in order to do a better job. 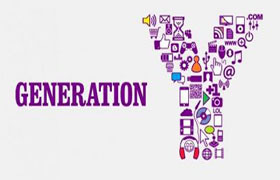 What exactly can companies do to motivate Generation Y at the workplace and decrease employee turnover for this generation? Flexible Schedules: No, they are not lazy! Yes, they are efficient. They can do stuff quickly whilst listening to music and be done before 6pm so they believe they should be allowed to leave the office. They value free time to spend on friends and hobbies. They like to take care of their health and enjoy socializing. With todays technology it is not that difficult to think of flexible schedules and going around rush hour which is a real waste of time. Rush Hour in Bogota is roughly 1-2 hours to work and back. Imagine what a person can do in 2 hours! Feedback: Yes, they want to know what their bosses think of their work and results. They want to be heard and to be rated. They are competitive so they need good communication and that their ideas are taken into account. They need the occasional pat on the back and a relationship that goes beyond hierarchies. Training and Learning Programs: Yes, they are extremely curious and love to learn. They want to gain more knowledge on special subjects and feel motivated by learning new skills. They want to become experts and need to feel like they are growing in both personal and professional levels. Inclusion in Company Strategies and Decisions: Yes, they want to feel like they belong. They want to feel proud of wearing the company T-Shirt. They speak a different language compared to their Baby Boomer bosses. They question procedures and methodologies and are fond of solving problems to which they usually have a thousand suggestions on how to get things done. They have good ideas but are not heard enough. Macro not Micro: They see the big picture, not the details. They understand more than their bosses think but are still treated like 3 year olds. They want to know where the company is going and would love to be part of the plan. Teamwork and Organizational Culture: Yes, they love teamwork. They enjoy getting things done in groups and having a laugh along the way. They figure that if you are going to spend a whole lot of time at work, then it might as well be enjoyable. The best Y-ersconnect better with companies that worry about organizational climate, environment and team bonding. Challenges: They do not enjoy doing the same thing over and over again. They need challenges and change. They are not good at monotonous jobs or boring repetitive routines. They are inspired by dynamic work environments and lots of decision making. Inspiring Leaders: They work better if they feel inspired by their leaders. Leaders lead with example and are usually emotionally intelligent standing next to their employees at all times (good and bad), whilst bosses command, take all the credit and inspire fear in the workplace. Y-ers do not enjoy dictatorships and will usually not endure these so they work better with leaders. They have strong values and work better if they feel connected and communicate with someone who shares those values. So as it turns out, it is not that complicated. Companies just need to understand and accept that every generation comes with a challenge and that they must adapt, accept and become more open-minded in order to get the best talent out of these generations. If done properly, the results could be exponential in terms of company results and rise of better leaders in the workplace. ABOUT OUR RECRUITMENT SERVICES By proactive systematic search and assessment for Job Fit and Cultural Fit, we spot and recruit the best possible candidates of all levels fitting to the specific organization. What clients can expect form us? L&A ESS consultants are experienced professionals. We are engaged to advise both clients and candidates ensuring achievement of win-win solution.